Occupying a beautiful site on the island of Storøya, the fairways of the golf course weave through forest and parkland close to the waters of Tyrifjorden Lake The first tee shots on the course were played in 1994 when a 9-hole layout was inaugurated but it took only another couple of years before the number of holes at Tyrifjord was doubled, enabling golfers to enjoy the pleasure of competing on a full sized layout. 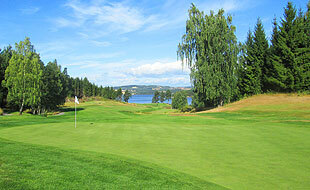 The opening three par four holes lead away from the clubhouse to Storøen Farm, the highest position on the island. Then, from the tee of the par five 4th, golfers are afforded fantastic views south towards Sylling before the fairway plunges downhill to the edge of the fjord. First time visitors who think the front nine is pretty spectacular should be prepared for a pleasant surprise as the inward half is even more beautiful. This circuit features a testing par three at the 13th – where its three-tiered green has the potential to derail a good score – and a couple of lovely lakeside holes at 15 and 16. I was fortunate enough to have Jan Nordstrom, the Top 100 Nordic correspondent, show me around the course at Tyrifjord Golfklubb a couple of days ago, at the end of a media visit to other golf courses in the Oslo area. Jan was able to point out the various improvements that have been made recently, including the removal of 5,000 trees and the introduction of new, rough-edged bunkers on several of the holes. Although not currently ranked on this website, the course looked from afar via my laptop to be situated in a beautiful spot and so it turned out to be in real life. In actual fact, change the description of “beautiful spot” to “stunning location” as the fairways really are set out on a gorgeous property, with panoramic views aplenty thrown in for free. The highlight holes for me on the front nine were the lakeside par three 5th, with water guarding the front and right of the green, and the downhill par three 8th, where I loved the funky halfmoon-shaped bunkers flanking the left hand side of the green. The back nine is definitely a stronger circuit, beginning with another good par three hole at the 10th, where the tee shot has to carry across a gully to a raised green. The round steps up a couple of gears at the 15th and 16th, both of which enjoy fantastic lakeside settings and these are easily the best holes on the scorecard. My biggest issue with the course was the number of multi-tiered greens that are just too severe for sensible golf (6, 7 and 13 spring to mind) and they, quite frankly, could do with being regraded so I hope they’re part of the ongoing course improvement plans. Don’t let a minor quibble such as that put you off from visiting this place though as it really is a largely undiscovered Norwegian golfing treasure that deserves a play.